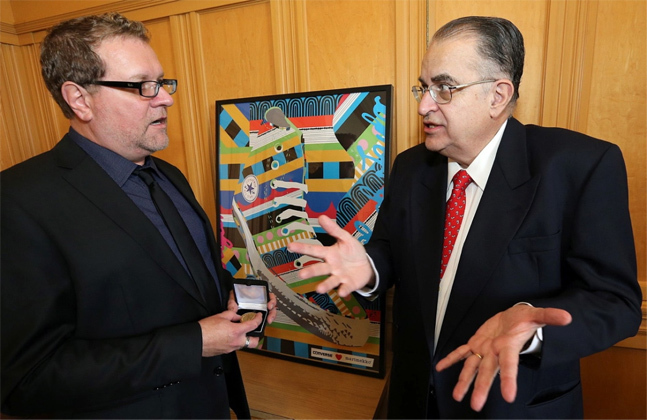 Victoria Graphic Artist – Andrew Lewis to receive prestigious GOLD MEDAL from His Excellency Francisco Suarez-Davila – Ambassador of Mexico in Canada and Ms. Claudia Franco – Consul General of Mexico. The Gold Medal was won by Lewis at the International Poster Exhibition of Mexico in Mexico City out of a field of 8,400 entries. The poster designed and illustrated by Andrew Lewis features a co-branding image between Converse (USA) and Marimekko (Finland) was used for local retail business Baggins Shoes of Victoria BC. Full story and images of the winning poster on graphicarts news website.